sunday morning my parents got me up and we got on our way to austin. i was feeling really crappy about life, the universe, and everything. (and when i say that, i’m not exaggerating.) when we got to austin, we were going to eat lunch at kerbey lane (on lamar), but the wait was 45 minutes so we gave up and went to a schlotzsky’s. we went back to the car and put the tire on, then my dad used an air compressor he’d brought to get the other three tires to the right pressure while i worked on the new fuel pump. in the instructions it said chevy small blocks don’t lubricate fuel pumps well enough, so i should pack the rocker arm and spring cavity on the fuel pump with heavy grease. back to advance to get some heavy grease. i packed the pump cavity. sometime around here, a guy in a 4-door ’57 chevy stopped and started talking to us. he knew some about engines, so i told him i was having problems getting the rod pushed up so i could get the fuel pump rocker arm in the engine block. he helped and i got it figured out. unfortunately, it became difficult at this point. the rubber hose side was easy enough to attach, but the metal tube just wasn’t lining up well. i had to connect, loosen, and disconnect the fuel pump two or three times trying to get the metal tube in and tightened. it felt like it wasn’t screwing in properly. to really get the metal fuel line movable, i could see i would need to remove a bolt behind the alternator, which would mean re-tensioning the belt, etc. gah. eventually i got pretty frustrated, and i knew i only had maybe 30 to 45 minutes of daylight left, so i just started cranking on the metal line nut. at this point i knew i might be stripping the threads, but i didn’t know what else to do. i finished and it was time to crank the engine. i got in and had to turn the engine for awhile before the pump would get gas through the line. then it car started. it was running. and there didn’t appear to be any fuel leaking! my dad got in with me and i drove it around the neighborhood for 5 or 10 minutes to see if it would fizzle out or blow up. it seemed to run okay, although i was paranoid about everything. i drove it back to the house. my parents left, then i hung out some with my brother and heather and miles (who had indeed been sick, and was tired). they got some pizza and i helped them figure out some speaker wiring in their house, hooked some of it up, and helped configure one of their remotes. then i decided to see if my mechanic work would get me to houston. the car ran fine. and my gas mileage back to houston was better than it’d been going to austin. the only thing of note during my return trip was that on i-10 between mason road and highway 6 i got pulled over by a dps officer. again. i’d just gotten a warning 3 days before. since my speedometer doesn’t work, i also had no idea how fast i was going…i just knew it was faster than pretty much all the traffic around me. the officer came up and said he’d pulled me over for my speed and took my license. after a few minutes he came back and said “alright mr. leifeste, this is a warning. now, you just a got a warning and you don’t want to get a ticket so you should watch your speed.” i thanked him and then said “so…uh…how fast was i going?” he said i was at around 78 to 80. (which meant i was 15 to 20 miles over the speed limit.) i told him my speedometer wasn’t working and i’d just put a new engine in, so i used to judge my speed by the rpms but i couldn’t do that yet on the new engine. i talked to him for a few minutes, then i made the short trip the rest of the way to my house. oh yeah, also, sunday morning before we left my parents’ house i suddenly remembered i’d forgotten to set out extra food for my cat before i left. oops. when i got home, she was desperate for both food and attention. but she was okay. the drive-by truckers album is actually both a cd and a dvd, both containing the same material, recording during their austin city limits appearance in september 2008. the paycheck cd was just recently released, the the hand cd is his latest. all hardbacks, the tchekov and turgenev are fairly old prints (and thus have that classic old hardback look and feel). my brother minored in russian in college, so he has more knowledge of russian authors than i do. i’m glad to get this mcpherson book. 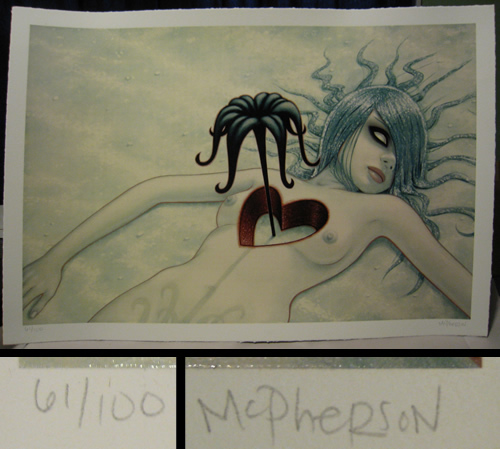 it has the piece i bought a limited edition print of in it, and even some things i don’t think i’d ever seen on mcpherson’s website. they also got me a dickie’s zip-up hoodie, and a reproduction of a map done in 1849 of california, mexico, and the republic of Texas that was originally published by a german map company. outside of the gift exchanging, my time in brady has been pretty uneventful. my nephew was teething some and possibly sick, so my brother and wife went back to austin xmas day. i visited with my grandmother today for a couple of hours. mostly i’ve tried to avoid thinking about having to deal with the bel air, and tried to avoid thinking about the other things in my life that make me feel depressed and hopeless. occasionally it works for awhile. unfortunately, i tend to find it pretty easy to focus on the areas of my life that i feel are important where i am not content. but tomorrow i get to try and deal with my car (at the least tomorrow, if things go well — otherwise, it may be for a few days). i can’t say as i’m looking forward to it. last friday after work i went out with some coworkers to byzantio. jamie joined me there for a couple of hours, then she and i got some fast food at jack in the box and went back to my place and watched war games. sunday i messed with the bel air some, trying to see if i could figure out exactly where the ticking noise was coming from, just so i’d maybe have more detailed info when i needed to talk to someone about the car. but i never figured out anything good. at some point i couldn’t seem to get it to start, and i finally decided maybe it was low on gas. i took a gas can to a station and got 1.5 gallons and put it in, and eventually the car started. i didn’t remember the gas gauge being quite so aggressive about when the tank was empty. sunday afternoon i headed back over to the potts. in the evening i had pot roast with them. later we watched the nightmare before xmas. i had taken the bel air. when i left, the car started sputtering as i was going up the 59/beltway overpass. fortunately i was able to get over the hump and was able to coast down to the median. i decided maybe i was out of gas. (i guess i should have filled it up after the incident earlier in the day, eh?) i called jack and he came out and brought me a few gallons of gas. the car started up. tuesday i drove my bike to work, which was a poor choice because around 5pm it started raining. it stopped before i left work, but the ground was rather wet. and that’s after i’d waited 30 minutes or an hour later than i’d originally planned to leave. wednesday we got let out from work early, then i met the whole potts clan at chuy’s for supper. oddly, the girl from the bank that had helped me with tamara’s account was there and saw me and came over to say hello. although i didn’t really talk to her at all because i was distracted by the potts kids excitedly attacking me with the xmas presents they had for me. anyway, i ate with them there and then went and did the radio show. and yes, at some point i finally started doing some xmas “shopping”. by that, i mean at the last minute i went around and picked up some gift cards. with the exception of a few cards i picked up monday and tuesday, all of my xmas “shopping” was done wednesday. i did this on my motorcycle. then i got ready for my trip home. now, if you’ll recall from my last entry, i really wasn’t too excited about the holidays in general this year. in fact, i felt like just not doing anything and not going anywhere and just sitting at home alone feeling sad and lonely and depressed. but i hadn’t been to brady in…i think a year…a long time for sure, and i’d been planning to go for months until the work on my car took so long and it had problems, so i decided it would be the right thing for me to go and see my family. i made a couple of stops for more xmas “shopping” but other than that i only stopped for gas. it really seemed like it was using more gas than i’d expected it to. then between bastrop and austin the engine started cutting out. i pulled over to the side and the engine never died, it would just sputter and lose power, then eventually pick back up. it did this for a few miles with me driving somewhat slowly on the shoulder, then it picked back up. it seemed okay again, so i got back up to speed and kept going. i thought maybe it had just had something in the fuel line or something and it got worked out. then just before austin it started doing it again some. while in austin, i called my parents and told them i might not make it and what my car was doing. i got through austin and stopped for gas. it was running sort of poorly at the gas station (same as before). i got on the highway and got a couple of miles, then it did it worse and actually died. i pulled over to the shoulder. i could get it to start, but it was lose power and die. it kept doing that until eventually it wouldn’t even start reliably. this is xmas eve, around 4:30pm. the wind is blowing like crazy, it’s around freezing, and there are snowflakes in the air. i had to call my parents and tell them, then call aaa. i was about ready to give up. no shop to take it to, no rental car plans, a car i’d just shelled out $15k on being a worthless piece of crap that nothing seems to be working right on. my parents said they’d come get me, which i felt crappy about. the tow truck driver showed up in about an hour, and i had the car towed to my brother’s house. (he was already at my parents’ house.) when the tow truck driver got the car to my brother’s, we noticed there was a lot of gas on the flatbed. some still dripping, from around the engine area. so i’m hoping maybe that just means the line from the gas tank to the engine wasn’t hooked up well, or some hose came loose or something. i don’t know. i’m still not sure exactly how i’m going to work this out. i was alone outside there for about 45 minutes, so i walked down some streets (looking on google maps) until i found a 7-11 that was open. i got some coffee and a fritter and walked back to the house. my parents arrived and picked me up, and i said goodbye to the dead bel air. since i’d made my parents drive all that way unplanned, i offered to drive back. on the way home between mason and brady i got pulled over by a dps officer. at the time i was barely going over the speed limit. it was a night 65, and i was going probably around 70. but he turned around and followed me a bit, then pulled me over. that’s the first time i’ve been pulled over since around 1996. and i drive a lot crazier than 3-5 miles over the speed limit usually. but he just gave me a warning, so that was a nice turn of events. well, the knocking hasn’t disappeared from my car. since i had the day friday free last week, i decided i’d take care of the edelbrock warranty stuff then. unfortunately, when i was getting together the documents, i noticed the edelbrock crate warranty card said you needed to send it in within 30 days of when the engine was purchased. uh…hrmh. i ordered it and had it shipped straight to the shop, so i hadn’t even seen this paperwork at all until i got the car back. that was over two months by itself. i was somewhat worried they would balk on me. friday i called them and was sent to voicemail. i left a message. after a couple hours of no return call, i called the technical line. they answered. i explained the knock and the guy said they’d probably have to send out new lifters — but it needed to go through warranty. he tried to transfer me but no one was answering, so he took my info. no call back that day. monday i called and had to leave another voicemail. no call back that day. tuesday i called again and finally spoke to a person. he told me the warranty is valid anyway, you just need to have a receipt. i explained what was going on and he told me what info i needed to provide. i told him i’d get it to him. he also verified if it was just lifter noise it wouldn’t hurt the engine and i could drive it as much as i wanted. (so maybe i can use it to drive home for the holidays even if it doesn’t get fixed by then.) that evening i collected the data, then called and left a message asking to verify the fax number and see if maybe i could email it. i called back wednesday and he answered, so i verified the fax number. he also mentioned a place they liked to work with in houston, and he asked me to see if it was reasonable for me to go there. they’re about 25 miles from me on the northwest side, but i checked out their site and they specialize in performance mods to cars…so that made me interested in using them. that evening i faxed all the relevant info and mentioned i should be able to take the car there. i called today and had to leave a message seeking to verify they got my fax. i didn’t get a call back. but for right now, i feel better about things than i did over the last couple of weeks. at least as regards the engine knocking. yesterday i called the mechanic i’d used to install the engine and do other work, to verify the weight of the oil he used in the car. while talking to him i also mentioned that the heat isn’t working, that sometimes when hitting the gas after shifting into second the car hesitates and loses power instead of jumping up and going, and that the clutch doesn’t seem to always disengage reverse/first from the flywheel. he said all that could be looked at and adjusted or whatever when i brought the car in. the thing is, i’m not excited about spending more money on anything right now. i’m not sure he’ll want to charge, but i already spent enough. i just want it to work right. a couple of nights ago i rented the daytrippers on itunes (99 cents). it was pretty good, not great. but the story was fairly interesting and the acting was okay. the general story is a married woman finds what appears to probably be a love note to her husband, so she and her family (parents, sister, sister’s boyfriend) drive from where ever they live into new york where he works so she can try to find out about it and/or confront him. hilarity ensues. it’s labeled a comedy, and it is, but a lot of the humour is kind of muted and/or about sad subject matter/situations. a while back i ordered a zippo lighter butane insert and a couple of meerschaum pipes. after a month or so they let me know they didn’t have the pipes. so i ended up changing my order to just two zippo butane inserts. i got them maybe a week ago. they’re called thunderbird american vintage and are made by vector. they are regular flame, not jet, and the casing looks/acts/sounds like a normal zippo insert. except of course it’s butane. the butane starts flowing when you open the zippo lid, and shuts off when you close it. this is done via a lever under the spring-loaded bit that moves with the hinge (like on a normal zippo insert). like a normal zippo, it uses a striker wheel and a flint, and has the same wind-resistant chimney design. i like the idea of the normal zippo inserts, but since i don’t smoke regularly, a lot of times i fill it and it evaporates and i’ve never used it, and i forget about it and when i need to use the thing there is no fluid. so this still allows me to have a zippo look/sound, but not have to refill it for no reason all the time because the fluid all evaporated. my new 1 terabyte usb drive hooked up to my airport extreme has been functioning nominally as a time machine drive for my desktop and laptop. soon i will convert my desktop to using the external hard drive i had previously been using as a time machine drive (320gb). i have recently run into two programs i wanted to use that only come in mac for intel (one being the google chrome browser), so at some point soon i may start getting an itchy trigger finger for upgrading my desktop. unfortunately, other than starting to find things that won’t be made to run on my powerpc box, the box itself is fine and still has plenty of power for what i use it for. so that’s setting up an internal struggle. saturday morning i got up at the crack of 10am and decided to go on a motorcycle ride with brad and some of his friends. since i worked late friday night (until around 2am), i had originally decided that and the cold would make me skip the ride. but i woke up and decided to do it. it ended up just being 4 total, and weather wasn’t too nice. it was chilly and foggy and/or misting the whole time. although it did provide an opportunity for me to wear the new skull half-mask and full-face balaclava. we ended up not going as far as we’d planned. i was out from around 10am until around 2pm. sunday afternoon i went over to the potts for simcha’s birthday party. i ended up staying over there and in the evening we watched a christmas story. and on that festive note, i’ll finish this entry. i think i’ve mentioned on here before that i’m a fan of tara mcpherson‘s work. i’d probably seen some of her stuff in the past, but the piece that really caught my eye some months back was one on the gelaskins site (they sell artist’s work as “skins” for laptops, phones, etc.) this particular piece was titled “hey we all die sometimes“. from that gateway, i went searching for more of tara’s work and learned she did a lot of poster prints for bands, comic work for dark horse, vinyl toys, etc. i picked up a book called lonely heart printed by dark horse of her work. there is a second book out called lost constellations, but i haven’t gotten around to getting it yet. there are one or two other prints i’ve been looking for by her that were done in limited runs a few years ago, but they’re kind of hard to come by. perhaps one of these days. aah, using time machine with an external usb hard drive connected to an airport extreme. here’s a blog entry. pay special attention to some of the comments, as they provide good info. here’s another good how-to guide on the macosxhints forum. Dec 8 20:12:36 rowboat /Applications/System Preferences.app/Contents/MacOS/System Preferences: Failed to resolve network service using name = F41LUR3\.3XTR3M3 type = _afpovertcp._tcp domain = local. googling that error provided no help to me, but it made me realize the afp mount probably wasn’t working. i also noted it was escaping the period in my airport’s name (F41LUR3.3XTR3M3) when displaying the name value. i went into safari and tried doing “afp://f41lur3.3xtr3m3.local” and “afp://f41lur3\.3xtr3m3.local” mounts…no good. i went into the airport utility and i noticed whenever you are entering the airport extreme name, it shows you the bonjour (or whatever) name below. it was turning the period into a dash. so i decided to change the name of my extreme from “f41lur3.3xtr3m3” to “3xtr3m3-f41lur3”. i rebooted the airport extreme for the change to take. i went into safari and tried “afp://3xtr3m3-f41lur3.local” and it worked. i double-clicked on the drive so it was mounted, then went into time machine in system preferences and clicked on choose disk. immediately the usb drive hanging off the airport extreme showed up. i picked it, and it’s now in the process of doing the initial backup. so here’s the thing to note: time machine does not like periods in the name of the airport extreme. it seems to handle a dash okay though. wednesday i got the order of two items that had originally been seven items. i got a black neoprene half mask (bottom half, nose and lower ears and jaw) with the bottom portion of a skull printed on it, and an all-black neoprene full face balaclava. thursday i took my motorcycle to work and wore the half mask. although it looks kind of cool, i’m not sure i’m a fan of the design. it doesn’t fit all that well on my face, and there really isn’t much to keep it in place other than the wrap tension…which doesn’t matter much if you ever have to move your head or jaw. since i’m supposed to be getting some highway miles on the car to see if the knocking/pinging goes away, thursday night i decided to drive to clear lake to get some take-out from village pizza and seafood. while driving there, the heat never seemed to function. which sucked since that’s one of the things i paid to get fixed. also, the knocking/pinging didn’t go away. before i left for food, i’d decided to reboot my powermac. i leave systems on 24/7, and i tend to leave them up for long periods of time. but eventually things like firefox and other stuff make things get slow or a bit wonky so i reboot to clear the memory, tmp, etc. when i do this i usually also install any software updates, since most of the time at least one of the updates requires a reboot. this evening, there were 3 updates: java, safari, and a security update. i ran the updates, then told my machine to reboot, then immediately left for clear lake. when i got back, my powermac’s fans were howling. this usually means the processors have been pegged (something is creating heat in the box) or the system locked. i got to the screen and it’d crashed during the update installs. uh oh. i held the power button to do a hard reset, then watched the system come back up. which it did, thankfully. and i logged in. everything looked okay, thankfully (again). but when i tried to start software update it wouldn’t start…just crashed. same with safari. same with most other programs. uh oh. in the system preferences menu i could see the java and security updates listed, but not the safari one. so i figured maybe it died on one of those, before it got to the safari update. after googling some from my laptop, i decided the best course of action was to download the standalone versions of the two updates on my laptop, then pull them over to my desktop and run them. so that’s what i did. the security update installed successfully and i rebooted. the java update installed successfully and i rebooted. i tried software update and some other programs…same problem. *sigh* so i went to terminal windows and started looking through log files. it looked like maybe it had started the safari update and crashed during it, so i decided to install the standalone safari package the same way i’d done the other two. i did that and it installed successfully and i rebooted. i tried software update and some other programs…and everything worked fine. *whew* i guess the safari code has hooks into the gui display of a lot of things or something. at some point i thought i figured out the heat in the car, but no — it just decides to work once in a blue moon for awhile. saturday i went by half price books and picked up some stuff for my brother, then later i went down to the potts. i took the car. i ate supper with them, then hung out and watched the rest of coraline i hadn’t seen. on the way home, the car started making some new weird noise which was troubling, plus the engine temperature gauge started going high fast. i pushed the clutch and let it coast. this caused the temp to drop and eventually the noise to stop. once i engaged the engine again, the sound would come back and the temp would go up. i exited 59 and went on the feeder so i could go slower and pull over if necessary. after a few miles of this, i decided maybe it wasn’t going to overheat, so i got back on 59. the temperature was hotter than it had been, but it fluctuated between 190 and 200, rising then dropping. i got home and turned the engine off, then watched the temp gauge rise to about 220. so i’m not sure what the heck was going on with all that. just more things to make me feel pretty dissatisfied with spending so much money on something that seems pretty crappy. and it shouldn’t, because all the stuff i bought myself was quality, higher end choices. today i went and picked up the world of warcraft battle chest (which gives you the original game plus the burning crusade expansion on a single dvd, plus some books) for $20 at game stop. it’s normally $40, but a few places have put it on sale for $20 since black friday. the only annoying thing is you have to pay a monthly fee to play, and i’m not sure how consistently i’ll play it. but i bought it anyway. then the potts came over and picked me up in their new (to them) vw bus. it’s an old vw bus. we stopped at autozone to get new wipers, then to get gas. then at the gas station it wouldn’t start. so i had to get out and help push start it. we went to pei wei and ate, then i had to help push start it again. it’s a typical old vw, which means it has all the attributes that make some people love them…and me not love them. or even like them. tonight i went over to the potts for a few hours. they were decorating their house for christmas, and then we watched christmas vacation. they decided to put up a stocking for me. it’s nice to feel included, don’t get me wrong, but it also is sad because it makes me feel like a loser that has no family of his own. (and by “family of my own” i mean wife or significant other or children or such, not me being a son or brother.) yesterday when i went over there, i took a bunch of the stuff that had been tamara’s or that i didn’t want anymore. one of the things i gave them was a small animated christmas tree tamara and i had bought. i got it out and set it up in their boys’ room. i guess i’m going to give them my regular christmas tree too. there never really seems to be much point in me putting one up myself. my belair didn’t seem to do anything out of the normal problems it’s been showing. it is of course still knocking/pinging. so here’s the entry about the banking stuff with tamara, which i originally wrote close to two months ago. but due to tamara’s lack of action, i kept having to add to it and hold off on posting it. since she finally got around to doing her part, here it is. when planning to put a new engine in my car, i decided to get a credit card that had 0% interest for 9, 12, or more months and use that to get a “no interest loan” (as long as i paid it off within the 0% interest period). i didn’t really care what bank it was through, just that it was 0% and a number of months. i eventually got an application for one, filled it out, and got the card. a few months went by due to my indecision about what engine to get, but about two four months ago i finally made the purchase. since i was now carrying a balance on the card and would need to make monthly payments, i decided to see if i could set up online access for the card. i checked what bank the card was issued by, then i went to their website and started going through the enrollment process. i entered my name, zip, credit card…then the site said their records showed i already had a user id that was tied to an existing account and asked for that account number. “eh?” i thought. a window popped up offering to provide help via online chat, so i did that. after their looking into it, it turned out they had found an online account i’d used at this bank back when i was still married. looking through some stuff, i managed to find my old user id, password, and account info. i had to change my user id due to newer naming rules, but the underlying account stayed the same. using the old password i found, it let me log in and i finished setting up my new user id. once in, what did i see? guess what else i saw: access to a checking account. yep, once i logged in, i still had full access to the checking account that i had used while tamara and i were married. it had been tamara’s before we knew each other, but at some point in the marriage we added me as a joint on the account. evidently she didn’t delete the account during the six years since she had the affair and left me. it had a balance. and what’s more, they told me the account was still active. i told the person in chat i really shouldn’t have access to the checking account. not only that, but my name still being on it means that my credit and such has been and is tied to the behaviour of that account. given tamara’s past, and past with me, i was understandably worried about still having financial ties to her (even though she’d been good about money before and while with me). they told me i would need to call the online banking group and explain it to them and have them remove my access to that checking account. so when i was free during the day one friday last month (october 16th), i went by the bank to find out what i needed to do to get my name off the account. as they said on the phone, you’re supposed to both be there to sign paperwork. or either of you can close the account and cash it out all by yourself. i understand the legal liability thing, but it seems odd it is legal for either person to come in and close the account and take the cash, but it’s not legal for one person to remove their name on something with a positive balance (i.e., not avoiding debt, but giving up access to cash). it also seems odd you can’t get the paperwork and submit it separately (maybe requiring notarization to cover fraud), or even have each of you sign the paperwork in person but separately. or that i can’t bring in a divorce decree that shows we are legally divorced and that the account in question was decreed as hers. as much as i would have gotten some amount of sadistic pleasure from just walking in and closing the account (especially given everything she did to me with the affair and in the divorce), i’m just not that kind of guy. so i used a potts proxy to get in touch with tamara to see if she would either close the account or sign the paperwork. she replied quickly and said she could meet sue somewhere and sign the paper. but they weren’t handing the paper out, so i had to get sue to send another email telling her she needed to go by the bank and sign the paper (which would be simple and convenient since it’s within a few minutes of the part of town she lives in). no response. after about a week, sue sent another email asking her to take care of it soon or i was going to close the account. no response. after another couple of weeks, i had sue email her and say if she didn’t close it, sign the paperwork, or get in touch and set a timeline by friday the 13th (it being a month since the first email), i was going to go in and close the account. no response. thursday evening (the 12th) i asked sue to call her. she had to leave a voicemail. i wasn’t too excited about taking care of things by closing the account, but it needed to be done. then friday morning sue called me and said tamara had gotten in touch with her. did she say anything about not communicating for a month? no. she just said it’s not convenient for her during business hours, but she could take care of it the week of thanksgiving. so…she got a reprieve of two more weeks. from entries i made since then, you can see she didn’t take care of it the week of thanksgiving. but finally, the week after thanksgiving, she got around to doing what should have taken maybe 30 minutes out of one day. and it only took her a few days shy of two months. well, monday came and went. throughout the day, no call from the bank, no call from the mechanic. yet another day of misguided hope. finally the mechanic called me around 5:50pm and said i could pick up my car. but… but the lifters were knocking, and they might need to be replaced. he suggested i drive it a few days and see if the lifters got better. i didn’t want to mess up the warranty somehow, so i said i wanted to call and see what the seller or builder of the engine said. i told him i’d let him know the next day. a bit later i texted sue to see if she’d heard anything from tamara. she said tamara had sent a message on facebook and told her she’d called the bank and made an appointment for the next day (tuesday). so yet another day where things were supposed to work out, but nothing did. more of the same crap. except things seemed closer to happening, but not all good like i’d expected. tuesday morning i called jegs to see what they said about the lifters, and they told me to call edelbrock. i called edelbrock and they said to drive it a few days and call them back if it didn’t go away. so i called the mechanic and told him i’d come by to pick up the car. at lunch a co-worker drove to my house with me and let me drop off my pickup, then he and i went and ate at house of pies. then he took me to the mechanic’s shop and dropped me off. the mechanic spent some time showing me the work he’d done, talked about various things, etc. he pointed out a couple of things that need to be done or adjusted after it’s been driven awhile. finally we were done and his wife gave me the bill. i was…surprised. no, i was shocked. the original estimate, although he didn’t really want to give me one, was somewhere between $2k and $4k, depending on things. the bill i got was $7600. that’s right around the same amount of money i spent on all of the parts i bought for him to install. so getting this work done cost me $15k. i had planned to pay him with money i’d had set aside for some time, then use the leftover of it to help pay off the credit card before the 0% period expired. now i’ve had to give the mechanic close to all of the saved up money. hopefully i will have enough extra cash come in over the next few months to pay off the credit card in time. i’m not sure now. as if that weren’t enough, i spent $15,000 dollars on an engine that is pinging — it sounds just like the engine that was in it previously. i know it should either fix itself or will be fixed under warranty, but it’s a huge stab in the heart. but wait. in addition, when i was driving it i started having a bunch of problems with first and reverse. like the clutch wouldn’t fully disengage the gears in the transmission, so when i’d go to try and move from neutral to first or reverse the gears would grind. eventually i had to just start forcing it, which sounds like sh!t and probably isn’t good on things. but wait. the speedometer wasn’t fixed in that $15k cost, so the needle bounces half the time and is off so i don’t know how fast i’m going. in my mind, when you’ve just laid out $15k, you expect things to be working and to feel happy about what you got. i did not. after stopping by the house to put on the current registration sticker, then getting the vehicle a current inspection sticker, i drove it to work. the knocking/tapping is loud and sounds bad. it’s kind of embarrassing, as in drawing bad attention to the vehicle. and that shouldn’t be the case after paying $15k to have a brand new engine put in. the more time i had to think about things, the more annoyed i got. i gave up on work pretty fast and decided to just go home. when i went to pay for parking, the machine only took my first dollar partially, then hung. i pulled the dollar out, but it wouldn’t take my credit card. it also wouldn’t give me back my parking token. then smoke started coming out of the machine. i pressed the help button. the smoke got worse. electronics and plastic were burning. more smoke. then i could see a flame inside the box. finally the machine spit my parking token back out. the person answered and i told them their box was on fire. then i walked to another pay machine. dealing with the box with self-immolation issues and then walking to a machine not on fire cost me $1 though, because i was at 54 minutes when i started with the first box and past one hour by the time i got to the new one. as much as i enjoyed seeing something of tmc’s self-destruct, i think it’s just as much a sign of how cursed i am. oh yeah, did i mention it also started raining about the time i had to walk across the parking lot to a box not on fire? and continued while i walked back to my car? the drive home sucked, as traffic was backed up and my windows were all fogging and i couldn’t really see the road for about 20 minutes. i suppose thankfully one of the things i got fixed was the heater core, because eventually the defroster managed to clear up the fogged up windows. maybe being stuck in slow-moving traffic wasn’t a bad thing. so where does this all leave me with the car, you ask? all told, i’ve now spent probably around $40k on the car. for $40k, i could have gotten a nicely restored version of my car. instead, i’ve got a car with steel rims, a crappy old paint job, a possibly fscked-up transmission, and an engine that cost me ~$10k that sounds like crap. i’m going to have to spend at least another $10k to $20k on it to get it nice. not real nice, just nice. this was supposed to be a happy point, getting the car. instead, i feel utterly defeated. oh yeah, back to tamara. i didn’t hear from the bank tuesday. i called the bank a bit before 5pm and left a voice mail, but i didn’t hear back. so i didn’t know if tamara did what she was supposed to do or not. yesterday evening i was at a pretty low point, ready to concede defeat to life. it was just really disheartening to think about how much money i’d just unexpectedly had to spend on the car, and it is immediately giving me the same problems before i had spent a dime on it. granted, some stuff is fixed, and some new things are on it, but after the cash spent the problems just seem to be really big deals. plus knowing what would take tamara 10 minutes to do, she had managed to drag out for over 5 or 6 weeks and had still not accomplished… it was just too much. finally today things got a bit better. having time to sleep on it, the problems with the car didn’t seem quite as overwhelming. although i’m still not happy. around 3pm i decided i was just going to leave work early and drive around, as my head wasn’t into work and i needed to drive the car anyway. but right before i left, i got a call from the girl at the bank. she said she had some good news…she’d just saved a ton of money on her car insurance. (no, she really said that. then she laughed.) then she told me tamara had come by and signed the paperwork. yea! so instead of riding around the freeways, i drove over to the bank and signed the paper. so thank G-d that’s finally dealt with. now i can post the entry i’d written over a month ago about that situation. i stayed at the bank for awhile and talked with the girl there, she seems pretty cool and i’ve enjoyed the several times i’ve had to talk with her due to tamara’s slowness in taking care of things. the drive-by truckers is a replacement, because my current copy was scratched. the eurythmics is a cheap upgrade to my cassette version. i like kevin clay, who was in my little dog china, so i bought that because i don’t think i have it. maybe i do. (it was cheap.) and i like bill mallonee and the vigilantes of love, but i never seem to be able to get into their albums. but i bought it anyway — it was very cheap. the most curious purchase is the p.o.d. album. i only got it because it was their first album, before they were popular, back when they were a sold out, on fire, no compromise xian band. (although this is a 1999 re-master of the original album.) i saw them play the new band stage at cornerstone that summer. i thought they were a good rage against the machine clone (although they were fairly early in the rapcore scene that developed, xian and not). they went on to big things, and developed their sound more. but the whole schtick about committing violence to satan/demons that the xian rap and rapcore scene used back in the day makes me laugh. (ask ash to describe xian rappers from that era, such as t-bone — it’s a good time.) that’s why i bought it. you know it’s good when the visual is of an angel (?) with a choke hold on a scared demon/satan, about to punch him in the face. back in the day at the cornerstone, the original version of the album had a thug/guy or angel with a choke hold on a demon/satan with a gun near their head. (original cover) “snuff the punk” indeed.